German Aerospace Center's youth portal DLR_next tweeted this photo showing the "face" on Comet 67P/Churyumov-Gerasimenko, Aug. 6, 2014. If you're a fan of the "Face on Mars," then you might just have a new best friend. 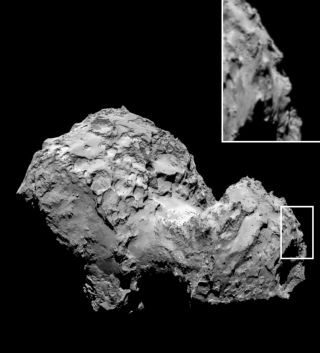 A new photo from Europe's Rosetta spacecraft has captured what appears to be a face on a comet in deep space, even if it's only a fun optical illusion. Rosetta captured the photo of Comet 67P/Churyumov-Gerasimenko on Sunday (Aug. 3) while en route to its historic arrival at the comet earlier today (Aug. 6). The image shows the 2.5-mile-wide (4 kilometers) comet in its entirety, with the face illusion visible on the right side of the comet. Officials with the German Aerospace Center's youth portal DLR_next (@DLR_next) spotted the optical illusion and pointed it out on Twitterwith several tongue-in-cheek posts today. DLR is one of the European Space Agency members participating in the Rosetta comet-chasing mission. Seeing faces in space photos is nothing new. They are examples of pareidolia, in which the human brain perceives faces, animals or other shape patterns in random images. A photo taken by NASA's Viking 1 Mars orbiter in 1976 sparked infamous claims of a "Face on Mars." Subsequent observations by other spacecraft, like NASA's Mars Global Surveyor and Europe's Mars Express, have proven the Face on Mars was just a trick of light and shadows. Other examples of false sightings in space include a rat on Mars, an alien Bio Base and — most recently — a strange flash of light captured by NASA's Curiosity rover. Rosetta arrived at Comet 67P/C-G (as it is known) after a 10-year and 4-billion-mile chase (6.4 billion km) across the solar system. The probe has already begun snapping stunning close-up photos of the comet. Rosetta is the first spacecraft ever to orbit a comet and will spend the next year and a half studying Comet 67P/C-G in extraordinary detail. In November, Rosetta is expected to drop its lander Philae onto the comet's surface for an even closer look.